Network security is not just a set of locked doors and passwords. A truly secure environment is an ever changing entity which requires constant care and monitoring. How Secure Is Your Network? Start Auditing Your Network Security with Nsauditor! Nsauditor is comprehensive network security auditing software for scanning network and detecting vulnerabilities, IT security auditing and monitoring. 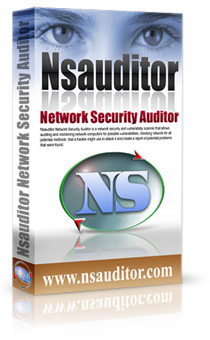 Nsauditor Network Security Auditor includes more than 45 network tools and utilities for network security auditing, scanning, network connections monitoring and more. With Nsauditor 1 user license you can scan all computers in your company without limits. Nsauditor is the easiest to use toolkit on the market. We grant you unlimited 24 / 7 support. You'll get all future versions for free. Your software license is yours to use FOREVER. No monthly, yearly charges, you pay just a one-time purchase price! Network Monitor shows detailed listings of all TCP and UDP endpoints, including the owning process name and details, remote address and state of TCP connections, as well as the host dns name, country , network class, appropriate service name and service description. NetBios Auditor is a tool to discover NetBios names. NetBios names are the names of the Services and Machines. NetBIOS Scanner is a powerful and fast tool for exploring networks , scanning a network within a given range of IP addresses and for listing computers which offer NetBIOS resource sharing service as well as their name tables and NetBIOS connections. After the NetBios audit process is over you will get general information about the remote computer including IP Address, Machine , Workgroup, Sharing, Ethernet Address, Adapter Producer. Also you will get information about workstation users, groups, machines. For each selected option ( Users, Users Log, Machines, Groups ) the appropriate fields will be shown. The workstation info will be available too. For each selected option ( NB Names, Services, Programs, Info, Hotfixes, Run, URLs) the appropriate fields will be shown. You will also get the information about Account Policies ( including Policy and Security Setting ) and Shared Resources. The information about Shared Resources depends on the selected option ( Shares, Hidden Shares, Connection , Browser Helper Objects ). This tool allows to perform an audit on a machine running MS SQL server. Packet Filter provides a real-time network packet filtering and analyzing. Packet sniffer filters the packet by all IP, ICMP, TCP, UDP, NETBIOS-SSN packet header fields. Packet Editor is a tool to decode IP, ICMP, TCP, UDP, NETBIOS-SSN packets. Audit Sun RPC uses ONCRPC (Sun RPC) protocols to access the port mapper daemon/service that typically runs on port 111 of UNIX or Linux machines. This tool includes a port mapper to dump where a list of all running registered daemons are shown. Audit MS RPC, is a Microsoft implementation of DCE RPC. The auditor dump is a list of named pipes that are used by Windows RPC services as endpoints. The interface identifier associated with each named pipe represents the service typically accessed when a given named pipe is used. Port Scanner is a fast TCP / UDP scanner, a tool that detects if certain TCP / UDP ports are open and accepts connections. TCP scanners are usually used to check if the remote computer runs services (e.g. Telnet or FTP). The main function of the port scanner consists in sending messages to the user-defined port list .The type of received response indicates whether the ports are opened. Port Scanner has the following scan modes: connect scan, SYN stealth, FIN stealth, Ping sweep, UDP scan, NULL scan, XMAS tree, IP protocol scan, ACK scan. CGI probes are sent against web servers. This tool provides an ability to turn them off and if the user is running an audit from a proxy server, he/she can configure the scanner to run CGI probes through that proxy. Adware Scanner searches the registry and gives you a quick look at the Adware, malware and spyware installed on your computer or in the range of network computers. Nsauditor does OS detection and automatically creates OS fingerprints which are not included in database. in different machines. This tool allows to identify and access password vulnerabilities. DNS lookup converts IP addresses to hostnames and vice versa and obtains aliases. DNS lookup performs advanced DNS queries, such as MX or CNAME. The full query list contains A, NS, MD, MF, CNAME, SOA, MB, MG, MR, NULL, WKS, PTR, HINFO, MINFO,MX,TXT,AXFR,MAILB,MAILA,*. DNS Lookup supports checking if the host is in a Real-time Black list for spammers "RBL ". The Email Validate Tool is a client utility for checking the validity of an email account. Enumerate computers is a tool to enumerate computers in a domain. Depending on enumeration parameters the tool can enumerate all computers , SQL servers , primary and backup domain controllers, etc. Ping is a tool that provides an opportunity to verify that the specified IP address exists. This tool is used to ensure that a host you are trying to reach is accessible. Ping also can be used with the reachable host to see how long it takes to get the response back. Also you can get information about the operating system of remote host . Trace Route is a tool that traces the route (the specific gateway computers at each hop) from a client machine to the remote host by reporting all router IP addresses between them. It also calculates and displays the duration that each hop takes. Trace Route is a handy tool for both understanding where problems exist in the Internet network and for getting a detailed sense of the Internet itself. Finger is a tool for discovering user information by using well known finger service. Using Finger tool makes possible to get "Abuse Address" of remote host. For example to get the abuse address of prontomail.com you should type prontomail.com@abuse.net in the finger input section. As a result you will receive abuse@mailcentro.com (for prontomail.com) in the finger response section. This tool will lookup information on a domain, IP address, or a name. You can select a specific WhoIs Server, or you can use the 'Default' option for the default server. Network Traffic Emulator generates IP / ICMP / TCP / UDP / HTTP traffic to stress test servers, routers and firewalls under heavy network load. It is a very simple and fast program which can simulate client activity. SIP UDP traffic generator / flooder generates SIP traffic to stress test voice over IP systems, SIP programs and implementations under heavy network load. You can randomize source port, include or exclude SDP, change number of packets to send, change SIP and SDP message templates to send various types of SIP messages INVITE, ACK, CANCEL, OPTIONS, REGISTER, BYE . Http Traffic Generator is a tool that generates an http traffic to the specified URL . Remote Shutdown allows remotely shutdown or restart network computers. This is a useful tool for testing some services, firewall and intrusion detection systems. This tool also can be used for debugging the program and configuring other network tools. of different kinds of network treatments as well as port scanning probes and network attacks. Web Log Analyzer parses the default file access.log which is written by Apache Web-server, converts it to XML document and analyzes the output XML file. IP Tables provides the tool to retrieve an information related to interface-to-IP address mapping table, IP routing table, IP-to-physical address mapping table. This tool shows the details about each IP address in the table. The each part of the table contains information about IP address including address, interface index, subnet mask, broadcast address, reasm size. This tool shows the available network interfaces and their IP addresses, Network Mask, Broadcast addresses, PPP, Multicast and Loopback modes. This tool shows the available network adapters and their MAC address, Subnet mask, Gateways, DNS servers, WINS servers, DHCP, interface names ,etc. to . This tool supports two ways of finding the country; searching by IP address or autonomous system number. the program name, the unique process ID, the full path of program executable file, the name of the file manufacturer, and the name of modules and kernel objects used by the selected process. This tool allows you to get information about adapter manufacturer. The only thing you need is to fill the full MAC address ( ex. 00:80:48:2A:83:41 ) or only the first part of MAC address ( ex. 00:80:48 ). DhcpExplorer allows you to discover DHCP servers on your local subnet or LAN and discovers DHCP server configuration parameters. Post Submit allows to POST submit your data, URL or other information. The program includes simple database that allows you to submit your web site to the Internet's biggest search engines - directories and request domain whois information. The program allows to add, edit and save your data to XML document and load it from XML file. This tool schedules programs and commands to run on local or network computers. You must have administrative privileges on the network computer and schedule service must be running in order to execute a command or computer program. Services are critical system components. Running in the background, they are widely used in the operating system to control hardware, monitor applications and support all system level functions. This tool controls the status of your network services and allows to start or stop remotely. Network Hotfix Scanner is a advanced hotfix check utility that scans network computers for missing hotfixes and patches, and helps you download and install them. Network Hotfix Scanner gives you a quick look at the hotfixes and patches installed or missed on any remote computer in your corporate network, it tells you by colored icons specific security bulletin rating ( critical, important, moderate ), title, description and bulletin URL. Remote Network Statistics displays remote network computer IP, ICMP, TCP, UDP and Server statistics. This tool allows to monitor and kill processes on local or network computers. 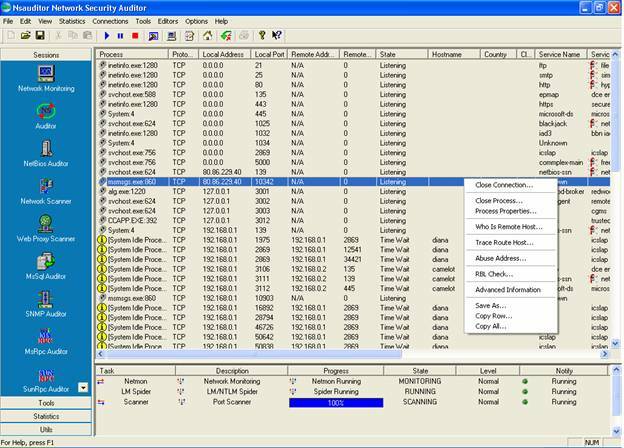 Nsauditor have incrusted intrusion detection system based on Security Event Log analyzing. Security Event Log Monitor monitors the security event logs of Windows NT/2000/XP servers or workstations and notifies of the possible intrusions/attacks by using E-mail, Net Send, Speech Recognition method or by playing user selected voice file. IeCacheExplorer displays the details of all cookies that Internet Explorer stores on your computer, reads all information from the history file on your computer and displays the list of all URLs that you have visited. It also allows you to clear history, delete cookies and temporary internet files, saves the results in the file or copies to clipboard and opens the appropriate URL. Personal firewall provides home users and small-business owners with the highest level of protection. It stops known and unknown Internet threats and blocks unwanted connections. Nsasoft products may be found in businesses all over the world, including international companies, non profit & government agencies, educational organizations.